Titanic offers one of the very best Blu-Ray releases available today. I have no qualms giving this set highest marks. It features a flawless A/V presentation and wonderful bonus features. This is the definitive version of Titanic. 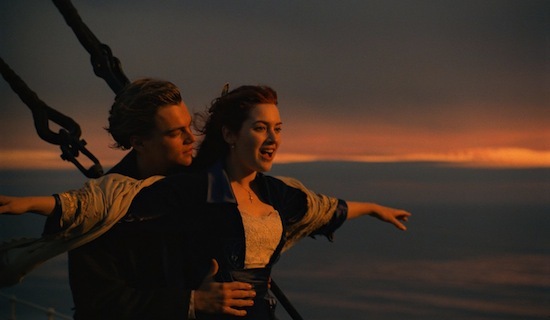 Despite its historic success, James Cameron’s Titanic has never had the home video release it deserves. The initial DVD presented the film in non-anamorphic widescreen with few features, and though the 2005 special edition was a massive improvement on all fronts, it was only available for a short amount of time. For the majority of the film’s lifespan, it has been difficult, if not downright impossible, to own a truly ‘definitive’ release of Titanic. Today, that bizarre oversight is finally rectified with the film’s arrival on Blu-Ray. It is available in two configurations – a 2D combo-pack featuring the film on Blu-Ray and DVD, and a 3D combo containing only Blu-Ray discs – but special features are consistent across both releases, and each provides a truly outstanding home video package. This is the release Titanic fans have been waiting fifteen long years to get their hands on, and it is absolutely worth the wait. I definitely consider myself a fan. Titanic came out when I was six, just as I was starting to get enthusiastic about movies, and it was one of those experiences that solidified my lifelong obsession with the medium. Titanic is epic in every way possible – the visuals, the characters, the set-pieces, and, of course, the emotional content – and though I originally saw the film on VHS tape, I was still swept away by the film’s mammoth scope. It opened my eyes to the incredible feats cinema at its grandest can achieve, and I immediately became enamored with the story of this doomed ship. Fifteen years later, little has changed, largely because one can sense Cameron’s incredible enthusiasm for the material ingrained in the fabric of every last scene. 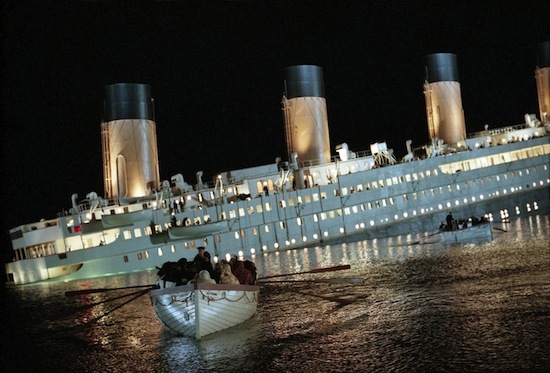 The Titanic tragedy clearly means something to him, and if one is on board with how he tells the story, the film is bound to connect in powerful ways. 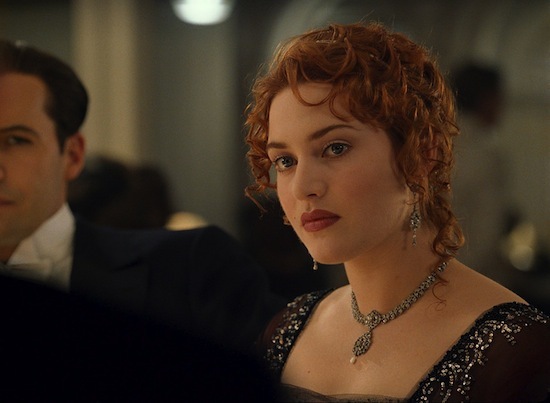 Cameron is equally sincere in crafting the central romance between Jack and Rose. The relationship has been endlessly mocked and parodied in the last decade-and-a-half, and though I can see why – high amounts of melodrama, cheesy dialogue, over-articulate messages, etc. – the romance has always hit home for me because every second of it feels earnest. Cameron believes in what he writes, honestly buying into the mystical power of love, and if one is at all inclined to dream a little bit when it comes to romance, I fail to see how one could ever deny Titanic. Cameron is a hopeless romantic at heart, and has been for his entire career. One of my favorite ways to describe Titanic, in fact, is to call it Terminator on a boat: Just swap out DiCaprio for Michael Biehn (wandering man who falls in love with woman while saving her), Winslet for Linda Hamilton (strong but dissatisfied woman who is saved by a mysterious man), and a large body of water for Arnold Schwarzenegger (relentless force of death with equally bland personalities), and the stories match up remarkably precisely. If one wishes to reject the romance in Titanic, one would have to start making fun of Kyle Reese and Sarah Connor as well, and that seems like a very silly proposition. Titanic holds up amazingly well after all this time. Even with special effects improving by leaps and bounds every year, there are sights in Titanic, particularly in the non-stop final act, that are simply unparalleled. The breaking of the ship remains one of the greatest set-pieces ever committed to film, and the performances – with the exception of Billy Zane as Rose’s evil, moustache-twirling fiancé, who was over-the-top then and is equally grating now – have not aged a day. Winslet in particular is just fantastic from start to finish, her work a stirring master class in giving a great ‘movie-star’ performance. Revisiting the film in 2012, I also find it interesting to see how relevant the film’s discussion of class-structure has become; Cameron’s social commentary is hardly subtle, but one must give him props for tapping into the zeitgeist a decade in advance. Whether one purchases the 2D or 3D Blu-Ray releases, the 1080p high-definition master is based on the multi-million dollar restoration performed earlier this year for digital 3D presentation. Here is what I originally wrote upon seeing this new master theatrically: Since Titanic was shot on film, I was worried that the amount of digital work needed for the 3D conversion might scrub away the grain of the original source, and detail along with it. Instead, Cameron has kept all the grain and warmth of the original film in tact, and even though this new version is projected digitally, much of the film evokes the impossibly rich texture of a 35mm print … This is simply a wonderful, respectful remaster of the source material, and I think it is safe to say Titanic has never looked this good before. Reviewing the 2D version on Blu-Ray, I find myself agreeing wholeheartedly with those original comments. This is a beautifully filmic master, featuring a perfect amount of grain and a proportionally vast amount of detail. The production design, costumes, props, and practical effects work shines through like never before, and there is nary a speck of dirt or trace of print damage to be found. Facial textures, meanwhile, are incredibly lifelike, the colors vibrant and deep, and contrast flawless from beginning to end. Not even a sizable amount of nighttime photography can slow this transfer down; if anything, the image becomes more lush and artistic when scenes grow dark, a testament to both the original cinematography and strength of this high-definition presentation. This is one of the very best Blu-Ray masters I have ever encountered, a truly revelatory experience that deserves top marks. It should be noted that this 2D Blu-Ray presents the film in its theatrical 2.40:1 aspect ratio. That is actually something worth celebrating, as Titanic was originally photographed in Super 35 to accommodate multiple aspect ratios. Previous DVD versions (and the alternate, 3D Blu-Ray release) offer the film in a ‘taller’ 1.85:1 ratio, but the tight, 2.40:1 framing is the intended and superior composition, and it is very nice to see it restored for the Blu-Ray presentation. On the audio side, Titanic features an absolutely flawless DTS-HD 5.1 track. Like the visuals, Titanic’s sound design is extremely multifaceted, ranging from soft, nuanced tones like the movement of objects and whisper of voices, to loud, bombastic elements like the breaking of the ship and James Horner’s sweeping musical compositions. All of it is rendered with incredible realism and clarity on Blu-Ray. Even when the sound becomes downright cacophonous, the mix is as precise and detailed as ever, and I guarantee listeners shall discover auditory elements they had never heard before. The track makes exquisite use of all channels, enveloping the listener from all sides with outstanding directionality and expert use of LFE. Like the video, the audio is a revelation, one of the best tracks ever featured on Blu-Ray. As for special features, I find myself at a bit of a loss describing the veritable treasure-trove of material assembled. While this is not the absolute best assortment of extras I have ever seen on home video, it is certainly among the most thorough. With three audio commentaries, two hour-plus documentaries, an hour of deleted scenes, sixty featurettes, a complete archive of marketing material, Cameron’s original ‘scriptment,’ design galleries, and more, it is hard to imagine anyone ever assembling a more comprehensive set of Titanic supplements. DVD and Digital Copy versions of the film have even been included for good measure, making for an undeniably ‘complete’ release. Yup, that’s a pretty staggering amount of material. Over six hours of video content, if we are to believe the packaging, and most of it is very good. I would recommend beginning with one of the commentaries – Cameron’s is easily the best, but the others are interesting as well – or the two newly-produced Documentaries. Reflections on Titanic is a bit overlong, but it’s a very nice piece on the making of the film and its historical legacy. Fifteen years of distance from the initial release gives each participant a very thoughtful perspective, and most of the key players (sans, oddly enough, Leonardo DiCaprio) are interviewed. Titanic: The Final Word is a very interesting piece for those interested in the archeological history of the ship itself, as Cameron and eight Titanic historians argue animatedly about how the ship sank. Moving on, die-hard fans will definitely want to check out the hour of deleted scenes, if only to find out how on earth a full hour was cut from a 194-minute movie. I was pleasantly surprised to see that these scenes are provided in full high-definition. They look extremely good this way, and are certainly worth a watch. The massive amount of featurettes are entertaining, if a bit too brief and choppy, while the Archive section is an unexpectedly fascinating area to explore. I find it interesting to examine the original marketing (and 2012 trailers are included as well), and the still galleries are surprisingly addictive. James Cameron’s original treatment, meanwhile, is a real delight. The man is a much better writer than many give him credit for, and some of the highly descriptive prose in this document proves it. It has been a long time coming, but Titanic finally has the home video release it deserves. With stunning, reference-quality video and audio and a wildly thorough set of bonus features, this is not only the definitive release of a classic film, but one of the very best Blu-Ray sets ever offered. After fifteen years, it is beyond refreshing to finally own this excellent film in the best possible quality, and I wholeheartedly recommend this release to longtime fans and newcomers alike. This article is based on a copy of the 2D Blu-Ray combo pack provided for review purposes. Portions of this article are sourced from my April 4th, 2012 review of the theatrical ‘Titanic 3D’ release.